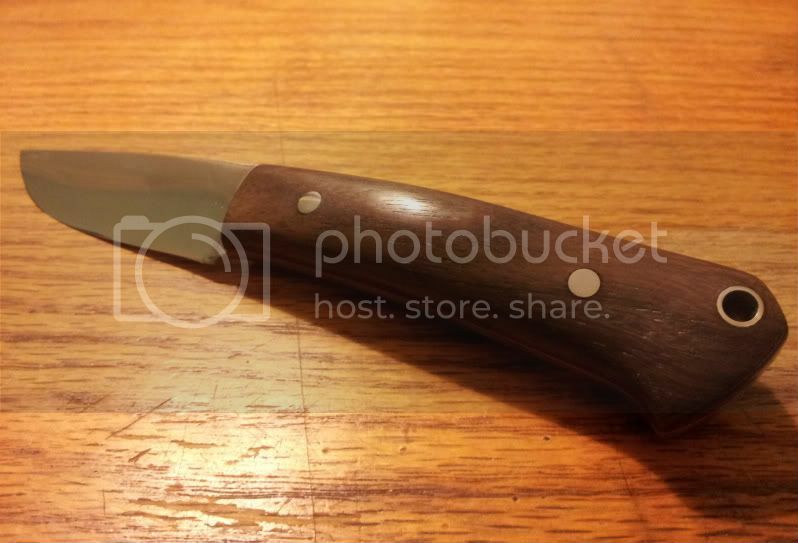 So, here's my first knife. It's kind of a pathetic story, as I bought the steel like, 5 months ago. Anyway, I hope you enjoy... if not, I'm terribly sorry for my amateur-ness. It was a long process, but thankfully I got plenty of advice and help from Red (Thanks bud). I cut this out with a hacksaw, filed the profile by hand, and royally botched up the convex bevel on Red's belt sander. The blade is 2 5/8" of 1/8" 1080 carbon steel. Full height convex (quite thin, great slicer). OAL is just under 7". Here's the earliest picture I have, just after heat treat (Thanks again, Red). I'll have that patch knife done soon. Then, I hand-ripped a piece of Indian Rosewood, glued it up, and shaped it all by hand with files and paper. You did a really nice job on that, HB! The rosewood looks great. How are you gonna scale the second one? Thanks GB, probably exactly like this one. I used this one as a test run, as I like the second one's profile better. I haven't been able to really buff it yet, but I think it'll look gorgeous once I do. I do have some micarta, though. Black paper and green canvas, but I love how the wood looks. I may get some stabilized dyed burlwood. Why, do you have an opinion on what would look good? Liner color difference with same wood? Also, it's not really a secret, but I have two larger knives (4" blades) that will be coming shortly after the patch knife. I may try different scales on those. No need to apologize.... you did a really nice job on that HB. 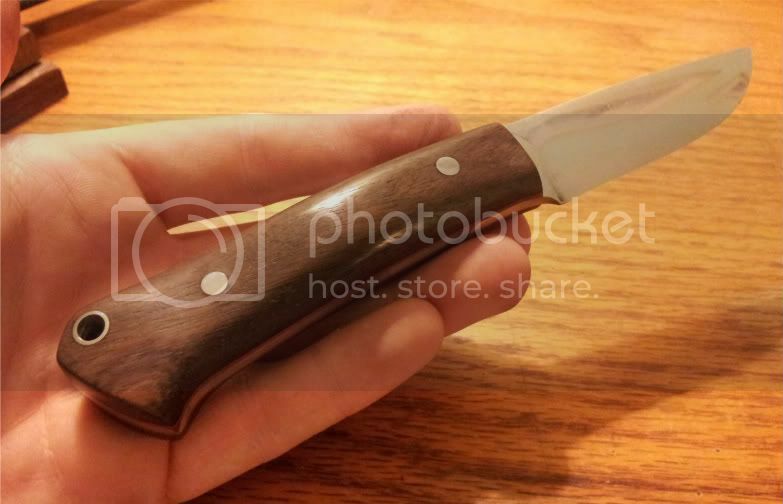 Did a good job on that wood project and now this knife, I'd say you have some natural talent at these things. That's really slick HB, I like the rosewood. Can't wait to see the second one though, I really like the shape of it. You did that with files and sandpaper?! Nice job! I've been holding off on re-handling some machetes because I can't seem to find anyone with a belt sander nearby. After seeing this I might just give it a try. Very nice job for a first knife! Very nice, especially for a first try. Looks like an awesome slicer. That looks great! I really like the looks of the second one too...be looking forward to seeing it. Man, that really turned out nice, HB! I think you should go full-time. looks great G!! well done bud!! Very nice work man! I really like the shape on both of those! The first one turned out great and I am looking forward to seeing the second as well! dude, that looks awesome. I'd buy the hell out of that knife. Thanks again, guys. I like it more as I hold it I buffed it up last night and it's gorgeous. I'll add pics soon. They're both nice , but the second is really catching my eye!! That, right there, is one heckuva nice looking knife :o. I'll wager that you will love that one for a long time for a lot of reasons. I sure wouldn't mind having one just like it! I don't know Red I think HB really enjoys his time doing things by hand. Look how much time he put into that awesome looking spoon. Very, very nice work. I can tell you had a good plan and thought it out. Thanks a lot, guys. I'm really motivated to do more knifemaking work. Here's a couple of teasers to hold you over till #2 is done. That sure does look good, you did a great job! !